Today’s Globe & Mail carried an oped from Don Tapscott, the Chancellor of Trent University, concerning the meaning of the 42nd federal election. Tapscott says: “Voter turnout jumped… in stark contrast to electoral trends in the United States and other Western countries, where a growing number of citizens just aren’t voting”. Are post-election narratives being written by Pollyannas? Uh, that’s not exactly true. The key turnout stat is percentage of voting age population. Stats Canada compared Canada to the US and the UK in the following chart up to 2011. In recent years, turnout in the US has been increasing while it had been relatively flat in Canada (until 2015). Certainly, Canada’s turnout rate hasn’t been anything to write home about, and we have hardly been in a superior position to the US or the UK. UK turnout has been steadily increasing. US turnout was higher than Canada in 2008, and US turnout in the past three elections has been at the highest levels in the last three decades. The 2015 Canada election is a spike up. On the basis of voting age population (a larger group than registered voters), the final number will be about 61%, I think (17.5 million voters out of a voting age population of 28.8 million). The UK’s 2015 turnout was 60.5% (of voting age pop) and 66.1% (of registered voters). Turnout is increasing everywhere in part because political parties are much more sophisticated in turnout techniques an place a greater emphasis on its role in campaigns. Which brings me to my other point about Tapscott’s piece. He heralds increased turnout as proof positive of positive campaigning and that the Liberals “refused to use negative advertising”. Yes, Justin’s advertising compared to the Conservatives was more positive. But those “sunny ways” share with occasional cloudy periods and thunderstorms. Did young people troop to the polls because of sunny ways or did turnout increase to “STOP HARPER”. The Stop Harper campaign and related strategic voting campaigns were the epitome of negative campaigning – imploring voters to vote against something as the first priority. Engage Canada’s pre-election campaign was not exactly a love letter to the governing Conservatives. That Justin conducted himself in a positive manner was a smart strategy in the context of the anti-Harper negativity, presenting himself as the antidote. The Liberals didn’t have to do much of the ‘dirty work’ though they did find time to rough up Thomas Mulcair along the way. That’s politics ! Hey, what do I know. I’m not a Globe op-ed writer, I’m just a simple countryboy from Haney, BC who thought Laurentian Consensus played for the Montreal Canadiens. It just seems to me that elections are about choices and contrast. A party puts out their agenda and leadership and compares it to the others. All parties did that, to varying degrees, and will continue to do so in the future. As they should. Let’s just not be Pollyannish in our analysis about what really took place. Voters are comparison shoppers. Yes, the Liberals profited by the comparison. Yes, more voters turned out. And yes, a negative view of Stephen Harper was probably the strongest impulse driving new voters to the polls. What happened here was not that unique relative to other countries, nor is it that unique in the context of election campaigns in general. This time, the Liberals just did it better. It took 148 years to elect a First Nations women to either Parliament or the Legislative Assembly from British Columbia. 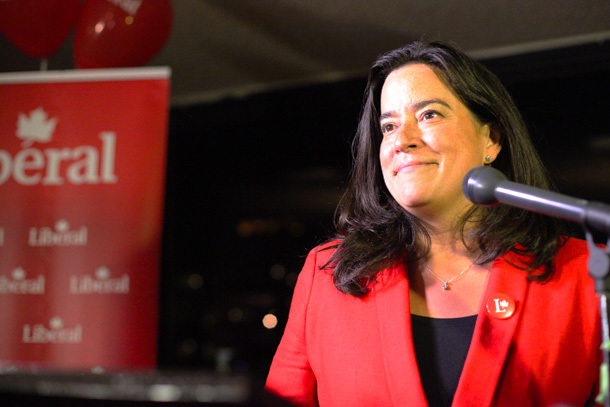 Jody Wilson-Raybould blazed a new trail in last week’s federal election. I wrote earlier how Len Marchand was the first First Nations MP elected 47 years ago, in 1968. He was also the last First Nations MP elected from BC, when he won the final time in 1974. 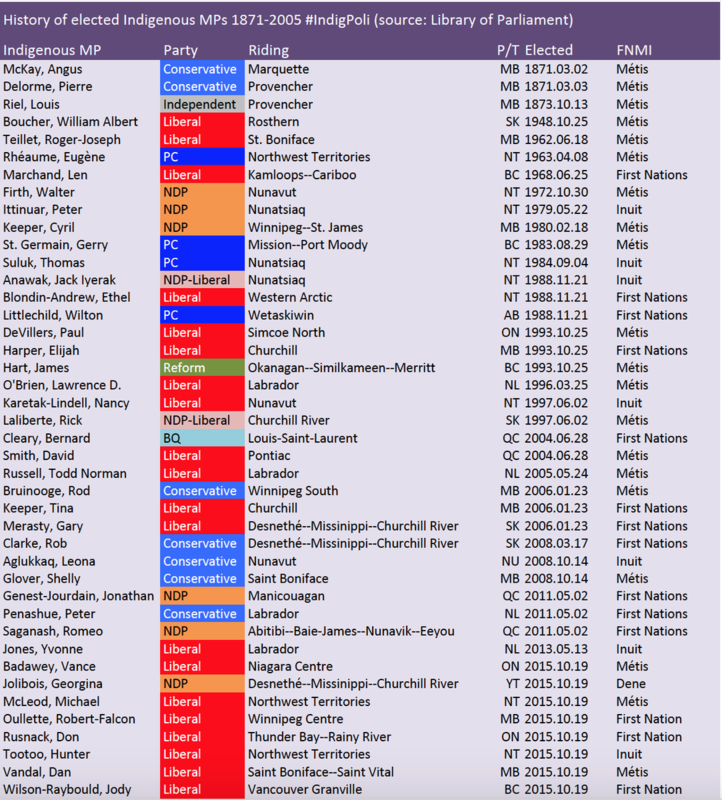 That’s 42 indigenous MPs over 148 years – 10 from the 2015 election alone (8 new). See CBC story. Status Indians right to vote was recognized by Parliament in 1960, only 55 years ago, and 93 years into Canada’s existence. Prime Minister John Diefenbaker’s Progressive Conservative government was in power at the time, and when Len Marchand was elected in 1968, he thanked Diefenbaker in Parliament for doing what previous federal governments had failed to do. British Columbia had done so in 1949, whereupon Nisga’a leader Frank Calder was promptly elected in the riding of Atlin to the BC Legislature and continued for 30 consecutive years. He was the first status Indian to be elected to any legislature in Canada and ultimately the first aboriginal cabinet minister in BC history. Frank Calder sparked the most important rights and title case in Canadian history when Calder (1973), argued by Thomas Berger, went forward to the Supreme Court of Canada. The Court ruled that title existed in a decision that reverberates today. Why so few from BC? Not a lot of First Nation candidates have run for office over the years and, clearly, not many have run in winnable seats. I am not qualified to speak on the unique social, cultural, and financial barriers that many First Nations face in seeking office, but I am familiar with barriers that Canadians, in general, face when seeking office, and they are substantial for anyone when contemplating public office. It’s both the general election and the party nomination that are the challenge. One reason why First Nations have been under-represented is the dispersed nature of their population. There are not many ridings in BC where First Nations form a large ‘bloc’. And even when you look at the densest concentration of First Nations in a federal riding in BC – Skeena – the reality is that it is made up of many, many different nations, all with different traditions. Look at Metro Vancouver or the GTA where we are seeing the election of MPs and MLAs from diverse backgrounds. This is happening in part because of strength in numbers. Their populations are concentrated in certain areas (eg. Chinese in Richmond, South Asians in Surrey) leading to the election of representatives from their community. This hasn’t happened to a large extent in Canada, except the North. It certainly hasn’t happened in BC. Policies matter too, of course. Haida leader Miles Richardson ran for the Liberals in Skeena in 2004 with high hopes but finished third to winning NDP MP Nathan Cullen. Cullen has just been elected to his fifth term and enjoys strong support in First Nation communities. While a person’s background help, winning candidates usually have to swim with the tide of opinion in their riding. I worked hard for Marion Wright, a former chief on the North Island. She fell short in the 2009 election, despite our hopes. She’s yet another example of a First Nations candidate that would have made an impact, however, she ran up against issues that favoured the NDP. While improving the party’s standing among First Nations, she lost most FN polls. 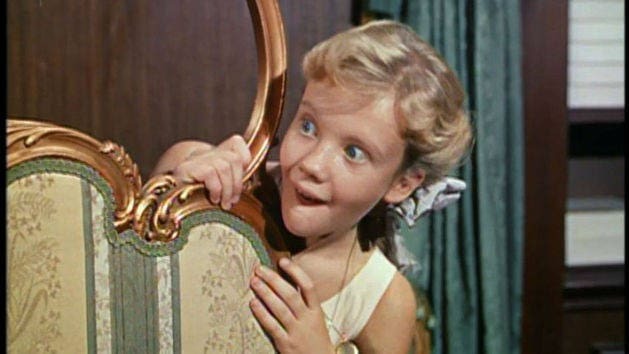 Marion tragically passed away not long after that election – she had a lot more to contribute. One of the keys to Jody Wilson-Raybould’s success is running for the right party in the right riding at the right time. She was a good candidate, but also had the benefit of swimming with the tide. Len Marchand first won in 1968 amidst ‘Trudeaumania’ and built the support necessary to hang on in tougher elections in 1972 and 1974. In 2015, Trent Derrick of the NDP had a chance in Cariboo-Prince George for the NDP but had the national momentum drain away. If there are more First Nations candidates in viable seats, then more will be elected, simple as that. I wrote a term paper in university based on Len Marchand’s work in the Senate concerning aboriginal representation. Basically, Len argued that – at that time- aboriginal Canadians merited about 3-4% share of the House of Commons based on population but due to the dispersal of its population, did not reach that level. He argued for guaranteed representation based on the aboriginal population in Canada. It was hard not to agree with the idea. We have guaranteed representation for PEI for pete’s sake. Guaranteed for Saskatchewan. Guaranteed for Quebec. Guaranteed for Nova Scotia and New Brunswick. Special deals here. Special deals there. Geographic deals are one thing, but the idea of parliamentary seats based on background seems to go against the grain in Canada. Perhaps this election is showing guaranteed representation may not be necessary, though there is still a long way to go before First Nations are represented in proportionate numbers. First Nations have strong leaders at the community level, engaging with the federal and provincial governments on a nation-to-nation basis. The argument that representing one’s nation is more impactful, instead of being a small part of a larger parliamentary institution must be compelling. One thing is certain, more aboriginal people voted this election and more were elected. Parliament will be better informed by those perspectives as a result. Len Marchand and Frank Calder have shown the type of impact they have had within these institutions. Now it’s Jody Wilson-Raybould’s opportunity to blaze a new trail, 148 years in the making. Incumbency had an impact on seat retention for the parties in BC, with all four parties re-electing members. 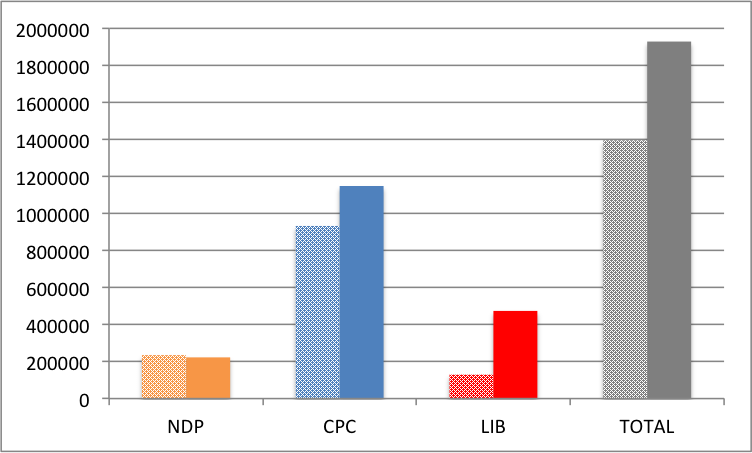 The CPC did not do well retaining seats, but did even worse retaining seats where they did not have an incumbent MP. Of the 8 defeated CPC incumbents, 6 were defeated by Liberals (five in Metro Van and 1 in Kelowna), 2 defeated by NDP (both outside Metro Van). The NDP lost two incumbents to the Liberals in Surrey. Of the 15 seats with no incumbent MP, the Conservatives did the best in 2011 when transposing those results onto the new boundaries. 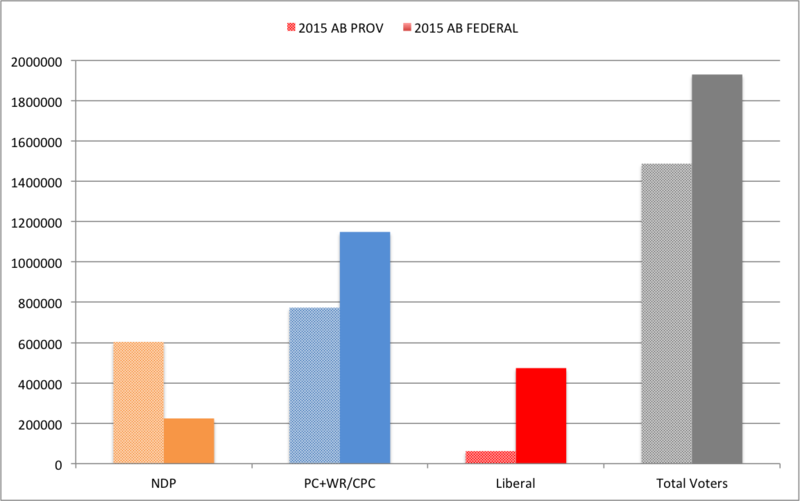 CPC had advantage in 12 of 15 seats; the NDP had advantage in 3/15. CPC only won 3 of 12 seats (25%) in their advantage areas, a much lower percentage than in seats where the MP ran for re-election. 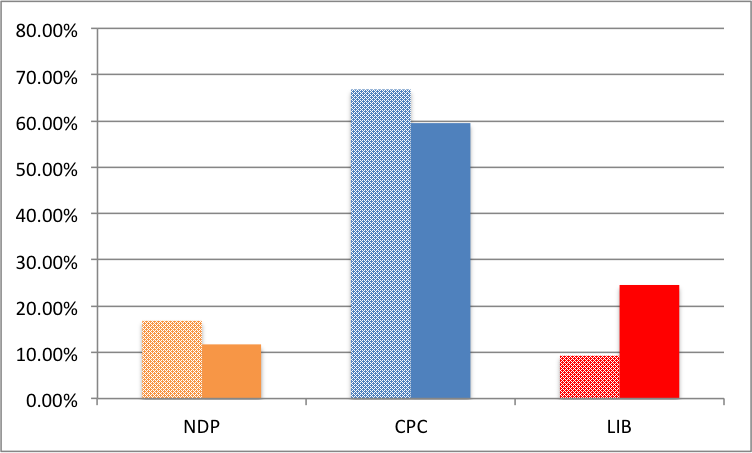 In non-incumbent seats, the NDP were 3/3 in seats where they held the advantage from 2011 and won 2 from the CPC. The Liberals picked up 7 seats where the CPC held the advantage in non-incumbent seats. The CPC incumbency advantage and 2011 vote advantage was under attack in Metro Vancouver by the Liberals and outside Metro Vancouver by the NDP (except in Kelowna where the Liberals stole a seat). With 47% of CPC incumbents holding on, why not 47% of Conservatives in seats where they held an advantage? Arguably incumbents did make a difference. Would retiring MP James Moore have lost in a close 3-way fight? Likely not. Would Randy Kamp have held on in Pitt Meadows-Maple Ridge if he had ran again? Quite possibly. 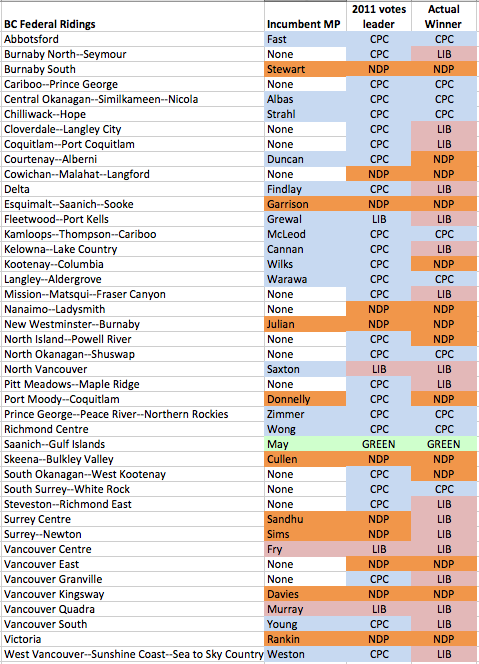 CPC incumbents in Cloverdale and Mission-Matsqui may have helped CPC hold those seats, but since the ridings were new, they didn’t have that luxury. On the NDP side of the ledger, two NDP MPs in Surrey lost in blowouts. No stopping the Liberal wave there (a South Asian Liberal wave?) But in Burnaby-South, Victoria, Port Moody-Coquitlam, and Vancouver Kingsway, incumbency may well have been the key factor in saving those seats. The political map of Metro Vancouver has a stubborn contiguous orange centre between East Van and Port Moody that is glued together by five NDP ridings, four of them with incumbent MPs and the other being Jenny Kwan, a longtime elected NDP MLA. They won nowhere else in Metro Van. Overall, the NDP withstood the Liberal wave in BC but failed to make necessary gains. They gave up two seats to the Liberals but took four back from the CPC. Arguably, they held up to the Liberal onslaught due to incumbents, but also held their vote in seats where they had the underlying advantage. In the final days of the federal election, respected community leader Tung Chan and Mike McDonald – publisher of this blog, contended that Chinese-Canadians’ voting intentions are not being adequately reflected by public opinion polls. Tung and Mike were right (as usual), but the problem of Chinese-Canadian participation in Canada’s electoral system goes beyond the polls. The 2015 federal election demonstrated that Chinese-Canadians are not coming out to vote and Chinese-Canadian Members of Parliament are not being elected, proportionate to their numbers. Hon. Alice Wong, re-elected in Richmond-Centre. One of two Chinese MPs from BC. The five ridings with the highest Chinese population ranked in the top six lowest turnouts in the province. Richmond Centre, which holds highest percentage of Chinese-Canadian citizens (44.3%) in the province, had the lowest voter turnout (59.0%). The top ten ridings with the highest Chinese-Canadian populations all fell within the sixteen ridings with the lowest voter turnout. The ridings with the highest Chinese populations correspond to the ridings with the lowest voter turnout. Period. Voting and polls only tell part of the story of Chinese-Canadians’ low participation in the electoral process. Of the 338 new MPs arriving in Ottawa, only five are of full Chinese descent and only three are in the new Liberal government: Arnold Chan (Scarborough-Agincourt), Shaun Chen (Scarborough North) and Geng Tan (Don Valley North). There is not a single Liberal Government MP of Chinese descent in BC, a province with over 430,000 Chinese-Canadians in Metro Vancouver alone. As Tung Chan stated, “Across BC, over 1 in 9 are Chinese”. Yet, only 2 of 42 BC MPs are Chinese. Alice Wong (CPC – Richmond Centre) and Jenny Kwan (NDP – Vancouver East) are the sole Chinese-Canadian MPs in BC. Alone, the statistics are indeed surprising. When looked at comparatively with another large ethno-cultural population in Canada, they are shocking. There are approximately 1.6 million South Asians in Canada, slightly more than the 1.4 million Chinese-Canadians. Sikh Indo-Canadians have famously participated in Canada’s democratic process since the 1970’s. The 2015 federal election elected the most South Asians in Canada’s history – twenty. That is four times (!) the amount of elected Chinese-Canadian MPs, eighteen of whom are in the Liberal Government. Four of BC’s 17 Liberal MPs are Indo-Canadian. As heartening it is to see one minority group in Canada participate in democracy, it is equally disheartening to see another not being fully represented. We can speculate that other forms democratic engagement – volunteering, party membership and political donations – are also disproportionately low amongst Chinese-Canadians. Not all communities participated at an equal level during the election that saw a high voter turnout. No. They had 96% of the votes they received when they won a majority in 2011. Had the number of voters stayed the same, they would have received 36% of the popular vote. However, the market expanded. An additional 2.7 million Canadians voted, pushing voter turnout from 61.1% to an estimated 68.5%. The blue line is remarkably consistent over four elections, ranging from a low of 5.2 million (2008 minority CPC government) to 5.8 million (2011 majority CPC). 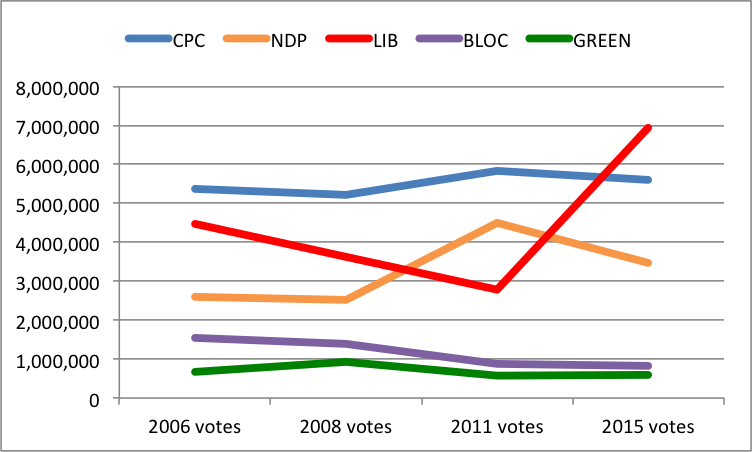 The total number of CPC votes in 2015 was higher than minority governments in 2006 and 2008. The absolute number of votes for the Greens has declined and levelled off. The Bloc continues its decline in overall voters. More seats this time, but that was thanks to a four-way fight in Quebec. The NDP can take some solace that they had the second most votes in the history of their party, almost a million more than Jack Layton’s campaigns in 2006 and 2008, but over a million less than the breakthrough 2011 campaign. Then there’s the Liberals. After successive declines, 2015 blew the roof off of their support eclipsing the steady Conservatives. On the surface, the 250% increase in Liberal support can be attributed to stealing market share from the NDP but moreso in terms of increased voter turnout overall. One reason why political party organizers don’t like strategic voting organizations is that they are likely to get it wrong when it comes to polling. In five BC ridings, they did just that. In two of those ridings, a Conservative was elected. In three other ridings, they picked the NDP and the riding went Liberal in close three-way battles. They could have screwed those up too, if their aim was really to “STOP HARPER”. Leadnow recommended NDP Trent Derrick based on Environics polling. He finished third. Final result: CPC 36.5%; Liberal 31.6%; NDP 25.9%. Oops! As of October 9-11, they had the Conservatives at 30% – they finished with 36.5%. I guess it was that late Blue surge? Leadnow recommended NDP candidate Jacqui Gingras. Again, it was the Liberal who had the best chance to win. CPC candidate Mel Arnold won with 39%, with the Liberals second at 30% and NDP at 26%. Yet the Environics polling had it at 37% NDP and 33% CPC, while Leadnow also published poll results from a firm called Oracle that had the Liberals at 12%! They messed up and got it wrong. Liberal Terry Beech won the seat with 36.2% of the vote, winning by about 7 points. Leadnow reported that the Liberal had the best chance, but on October 15th, Dogwood released a stale poll from Insights West (Oct 5-10) that had the Liberals third at 17%. Wrong call, bad polling, and, frankly, reckless. Leadnow recommended NDP candidate Sara Norman and released poll results (Environics, Oct 9-11) claiming she led the race with 38%. Well… turns out the Liberals won the dang seat and the NDP were third. Libs 35%; CPC 32%; NDP 27%. The riding I grew up in – it hadn’t elected a Liberal since they lost to the federal Socreds in the 1950’s! Until yesterday. Leadnow promoted a September poll that had the NDP at 41% compared to the Liberal at 19%. Might have been true… then. Election night? Liberals 33.8%, barely edging the CPC at 31.4%, with the NDP pulling up third at 29.6%. 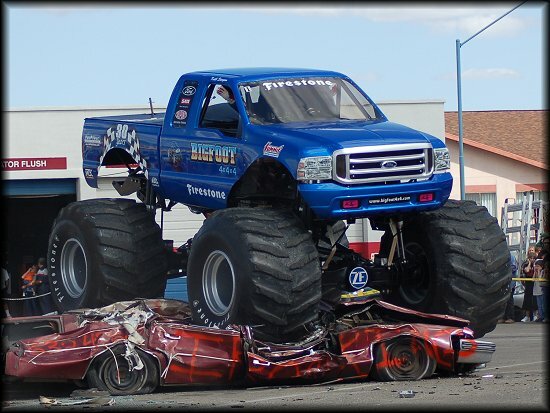 Close shave. The Vancouver-Granville brouhaha has been well documented. Leadnow endorsed NDP Mira Oreck. From the standpoint that they had written off the Conservatives, they were correct. Liberal Jody Wilson-Raybould won the race handily, as predicted, but Leadnow left a lot of people confused as to their definition of strategic voting. The Leadnow website simply listed the NDP MP in Surrey-Centre as the choice. From the standpoint that the CPC were out of the running, they were correct, but it was the Liberal Randeep Sarai who won. The same almost happened in Burnaby South where up-and-comer Liberal Adam Pankratz almost nipped off NDP MP Kennedy Stewart, who was promoted on the Leadnow website. These examples are not such a big deal but Liberals might feel a little peeved. Five ridings is a lot of ridings to get wrong. They basically played into the hands of the Conservatives, and helped elect two of them by sending mixed signals. I’m sure there are some chagrined Liberals who saw the endorsements or promotion of the NDP undermine their more legitimate chances of winning. As well, the polling that was done by Dogwood lacked transparency. They did not release cross-tabs to the public, which should be common practice for all publicly released polls. I will credit Kai Nagata of Dogwood for opening a dialogue on polling issues and stating that they are going to learn from the experience. We’ll see. Releasing polling data is very risky unless you are committed to doing it right. Doing it right is NOT doing it on the cheap nor is it doing it well before voters have made up their minds. Of course they were wrong! The Liberals surged and rendered their polling info useless except for the fact it served to mislead voters as to who had the best chance. Why they were polling in May and over the summer, I will never know. They simply wasted their donors’ money and misguided their own strategy.